An awesome, scary pumpkin design. This display was huge! 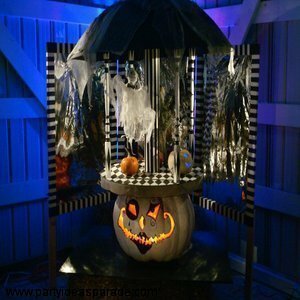 This awesome pumpkin carving display was called the LE CARROUSEL MACABRE...it was a pumpkin with a moving carousel on top of it...yes, a macabre carousel...perfect for the Halloween season. Take a look at this amazing pumpkin display from the Great Pumpkin Carve held in Salem County, New Jersey every October for Meals on Wheels of Salem. Can you imagine how long it took to create this macabre scene? The top actually revolves...it was an amazing feat to behold. Create your own awesome pumpkin carvings with help from our Pumpkin Decorating Kits. Get all the templates, tools and ideas you need to make your own scary or funny pumpkin carvings. You don't have to create a carousel with your pumpkins to have a wonderful time! Join in and write your own page! It's easy to do. How? Simply click here to return to Awesome Pumpkin Carvings and Pictures.